RhinoLight is an innovative treatment modality for Seasonal and Perennial Allergic Rhinitis. So it is an alternative or complement to allergen Immunotherapy and long-term drug therapy (such as steroids, bronchodilators, antihistamines, mast-cell stabilisers, etc.). 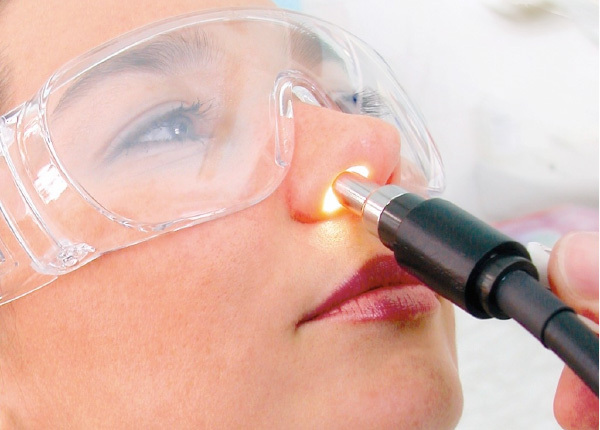 The RhinoLight medical device is used to direct controlled doses of uVA and uVB and visible light up each nostril of a patient with AR, where the emitted rays in effect give the mucosal surfaces a sun-tan, and so knock out the Mast Cells and Eosinophils and other cells involved in the inflammatory cascade of Allergic Rhinitis. For Seasonal Allergic Rhinitis, caused by pollens, the treatment regime time is 2-3 minutes per nostril, 3 times a week for 2 weeks, at the start of the pollen season (Or 2 times a week for 3 weeks). Total 6 treatments. For Perennial Allergic Rhinitis, caused by HDM for example, RhinoLight treatment is usually 2-3 minutes per nostril, 3 times in Week 1 then once weekly for 5 weeks, at any time of the year. Total 8 treatments. These protocols are reasonably flexible, depending on the circumstances of the patient. It is entirely possible and can even be advantageous to use RhinoLight (which can give more-or-less immediate symptom relief) simultaneously whilst going through the 3-month Initial up-dosing Treatment Phase of Injection Immunotherapy, as the symptoms would otherwise with SCIT alone only start to go into remission after 2-3 months. Similarly, the use of Sub-Lingual Immunotherapy usually takes 2-5 months for the remission of symptoms, so if RhinoLight is given early then there can be a more-or-less immediate relief of symptoms, which is maintained until the SLIT Immunotherapy treatment also has its own beneficial effect. RhinoLight is CE marked and classified as a Class IIa Medical Device. Clinical documentation of safety and efficacy can be found in >20 papers; available on request from Bio-Diagnostics or from the Rhinolight website. There are approx. 300 RhinoLight units in use around the world, including Hungary, Germany, Turkey, Japan, Australia, etc. Now available also in UK and Ireland. The capital cost of Rhinolight is very modest in comparison with Sub-Lingual Immunotherapy, as during a three year period RhinoLight can treat between 3000-4000 patients with Seasonal Allergic Rhinitis or Perennial Allergic Rhinitis. Therefore the economy of treatment with RhinoLight is highly advantageous for both NHS and Hospital Allergy Clinics and for Allergy/ENT Specialists in private practice. In summary therefore, RhinoLight is an innovative and effective treatment for Allergic Rhinitis, which can not only provide more or less immediate relief of the symptoms of Allergic Rhinitis but can also speed up patient throughput in busy hospital allergy clinics.